When I see friends at the San Diego Comic-Con, they sometimes give me samples of current work, and that was the case with this comic from Zander Cannon. 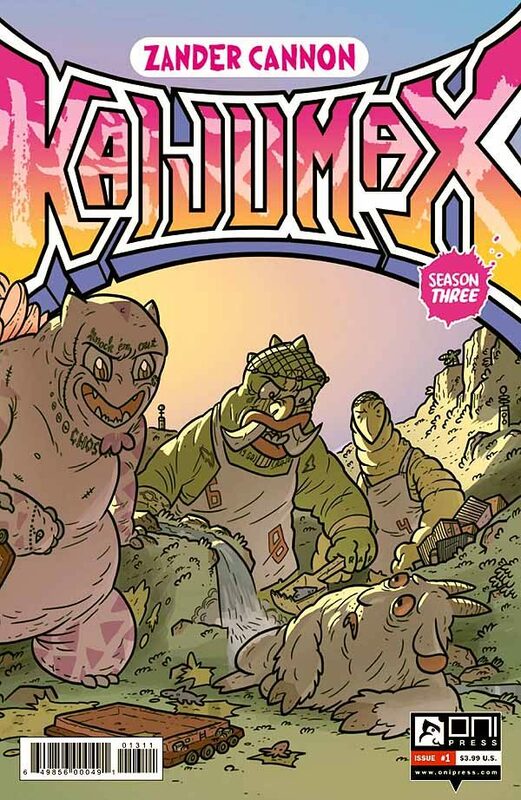 Though I’ve liked everything Zander has done in the past, and have enjoyed working with him on TOP 10 and other projects, I haven’t yet read any of his new series KAIJUMAX. Jumping in at the beginning of the third series is probably not the best way to go, but that’s what I did. The premise is easy to understand, and Zander has a fine one-sentence summary on the inside front cover: “On a hidden island in the South Pacific likes KAIJUMAX, a high security prison for giant monsters.” So, think of Japanese monsters in particular like Godzilla, and put them in a prison movie, and there you are. I’m not a big fan of either giant monster or prison films, but I’ve seen enough of each to get the idea. It’s a scenario that could be played a lot of different ways, from comedy to drama, crime thriller to science fiction. This issue seems to be going for a realistic prison drama where the main characters are tough guy monsters, gang members, except for the protagonist, a smaller goat-like monster kid named Daniel, who is well out of his depth, and being taunted, abused, and played by the seasoned inmates. I found myself empathizing with this character from the start, even while knowing he was in a world of trouble with no easy way out of it. Daniel is, indeed, in the lion’s den. When his mother comes to visit, it gets all the more poignant. Daniel’s mother seems to be human-size, making the relationship puzzling, and his mother is not, herself, very sympathetic to Daniel’s plight. But a ray of hope appears near the end of the issue when Daniel witnesses a prison crime, the knowledge of which may help him in the future. This is just as cool and compelling as all Zander’s work, with less humor than I expected, but thoroughly involving. I hope to read the rest of the series at some point. This entry was posted in Comics, Reviews on July 27, 2017 by Todd.